Plant Avenue: Can You Root A Rosemary Cutting? 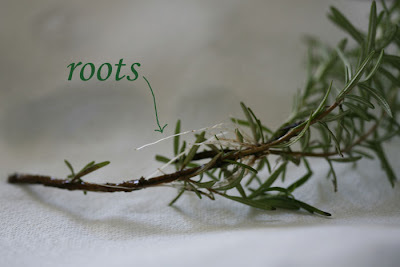 Can You Root A Rosemary Cutting? This is my second attempt to root a Rosemary cutting. The first time was successful, only to eventually die after it was planted in soil (not sure why - it might have been too small to survive the winter outside?). I thought I'd try again, this time indoors. I checked my cutting today and noticed something interesting. Last time the roots formed at the very bottom of the cutting, but this time the roots are growing out from where the green needles are, with no trace of roots at the bottom. I'm curious to see how this cutting fares once I plant it (maybe tomorrow?). I'm planning to keep this one indoors over the winter. Wish me luck! Interesting! I love rosemary. It smells wonderful. Can't wait to hear the outcome. I've had good luck sand layering rosemary. Just Pin down a stem that is still attached to the main plant and cover the section lower portion of the stem with a mix of sand and peat moss. When roots had appeared and are substantial cut stem off and pot up.Good luck and welcome to Blotanical. Thanks :) I've heard about sand layering (never tried it though). It reminds me of how strawberry runners manage to find their way into the soil. Lawn and Gardening Tip Resource-Turn to the Lawn Care Help And Garden Experts! Let's Go Gardening UK - The one stop gardening site for all your garden needs.